Welcome to the only dedicated Bostrom 37 website in the world......outside of Sweden. Actually this is just an informational "home page", not an interactive website for Bostrom owners (there are only a few in all of North America anyway). Ever since I bought this boat I have searched for information about it, largely to no avail. This home page is my fun thing to do and I like the idea of introducing cruising sailors with a love of boats to a yacht they have never heard of. 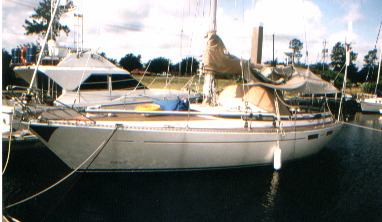 The Bostrom is an ocean boat, a sea boat, designed for passagemaking; another of many European boats that are relatively unknown in North America. If built today it would be called a "performance cruiser". Occasionally if you go into European "boats for sale" sites you will find a Bostrom for sale with some info to be gleaned. I'll save you the trouble and fill you in on as much as I've learned to this point. This is actually a great shot but I'm working on getting a cleaner image. Obvious shot from the masthead showing the substantial beam carried well aft. The 120w solar panel on top of the bimini looks crooked but it isn't. 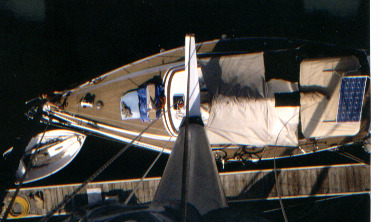 Each end can be detached and raised to face the sun if shining perpendicular to the boat for much greater efficiency. A few months ago when I first started this homepage I was just fooling around. Yes, I was thinking about selling the boat, but I also liked the idea of simply writing about the Bostrom, and getting some pictures on the web. Of course it took awhile for the search engines to pick it up so I didn't get much feedback. Over the past 6 weeks or so more people have been finding the site and saying hello. Most are very encouraging, but a couple have indicated that I have ruffled some feathers. How could I not? If you have a boat that I have criticized then you are going to take offense. None intended.